Angie Broks inspires through sharing a few of her favourite things…Natural Hair, Beauty, Fashion, Travel & Life Style experiences. I have a real passion to equip people with knowledge and to see people grow in every area of their lives. I pray my website will be a place of solace where you will find resources that will equip you in this journey called life. It is my heartbeat to share keys and principles that will help you live out the best possible version of yourself. Here’s to you being your magnificent best and daily surrendering to God’s plan for your life. It is said that your life is a gift from God and what you choose to do with it is your gift back to Him. The next 12 months of this New Year 2107 is a blank canvas waiting for us all to put our imprints on it. It is yet another opportunity to live a life of purpose, to plan and to produce meaningful work and life experiences that will bring our hearts the greatest joy and fulfilment. Living life intentionally and on purpose in 2017 will in turn prove to be a great blessing to us, our friends and families and to those in our sphere of influence and beyond. I however find that to plan for a productive year, it’s always best to do an introspection by reviewing the year that has just gone by. So instead of being so quick to discard 2016 as being done and dusted, before I dust it off completely, I find that it’s always a good idea to spend some time reflecting on the previous year. By reflection I mean to look back on 2016 and to draw on the valuable insights, experiences and life lessons one has learnt from the previous year. It is to derive meaning and understanding behind the highs and the lows of the previous year, the joys and the sorrows, the tests and the trials and the ensuing testimonies. All these experiences though hard-won contain valuable nuggets of wisdom which if harnessed properly and applied in 2017 can set you up for a great new year. For it is only in looking back, reflecting and extracting those hard-won lessons from the previous year 2016 will we be better-equipped to handle this new year with all the possibilities and opportunities that it holds. It’s been said that the definition of insanity is to do the same thing repeatedly and to expect different results. So, in looking back, we get to analyse the lessons that served as well in 2016 and we purpose to go into this New Year with those lessons and to discard the lessons that didn’t serve us so well. That is how you set yourself up for a productive new year. The quote above by Steve Jobs, the founder of Apple Inc. perfectly encapsulates the wisdom in looking back in order to move forward or as he puts it ‘you can’t connect the dots looking forward; you can only connect them looking backward’. In his own words ‘This approach has never let me down, and it has made all the difference in my life’. It is not wise to compare your life’s journey with another’s. For sure, you can take inspiration from another’s journey through life but you have your own unique set of life experiences, strengths, weaknesses, likes, dislikes and preferences that make you quite unlike anyone in this world. That difference if properly harnessed can become your USP (unique selling point) or your advantage in this life. Life is all about choices and decisions. You are where you find yourself in life today because of the choices you have made in the past whether good or bad and you are the only one who can change the course of your life this 2017 if you will boldly make choices and decisions that will move your life onward and upward and into where you want to be. That is why it is so important that from the onset of this New Year you define what success means to you. In other words, define success on your own terms. Defining success on your own terms is designing a life that allows you to embrace your individuality and to create a life that contains the things that bring you the greatest joy, happiness and fulfilment instead of chasing a ‘cookie cutter version’ of what a successful life ought to look like. In 2017 decide to dial up the sound of your own voice where you exercise the free will that God has given you to design a life where the people, the things that matter most to you, the work that brings you the greatest fulfilment, joy and contentment are included in it. This allows you to live life authentically and on your own terms without allowing the thief of comparison to rob you of your peace and happiness. Defining success on your own terms is also about designing a life which includes the things you feel deep passion for, the causes that matter most to you and where expending your time and efforts fill your heart with the most joy. Defining success on your own terms is about achieving your boldest dreams and ambitions but doing it on your own terms and about dancing to the beat of your own drum. No one can define success for you. In 2016, I learned a very valuable lesson which is that God’s gift of free will to me means that in union with Him only I can decide what success looks like to me and on the strength of that blueprint I have the freedom to embrace the opportunities and possibilities that come my way and that align with that definition of success. This brings my heart the greatest joy because in the end we only regret the chances we didn’t take. Please don’t subscribe to a ‘cookie cutter version’ of what success is. In conjunction with God the creator of the universe, let His Word (The Bible) help you to define success on your own terms. The Bible if studied contains so many valuable life principles and wisdom keys which when applied to your life will see your life tangibly going from strength to strength and from grace to grace. Defining success on your own terms is doing well at what you love and doing it with excellence as your hallmark. It is being well regarded by those who mean the most to you. It’s about learning about yourself and what you want out of life and having the confidence to admit it to yourself and to those around you who mean the most to you. It’s about having the grit and virtue to pursue with passion your life’s dreams and goals. Defining success on your own terms is about living your life in accordance with your values and being authentically you by pursuing the things that bring you the greatest joy and by contributing your gifts, talents, abilities, time and resources to causes that matter the most to you. That is what defining success on your own terms is all about. Happiness doesn’t come from success. Success becomes happiness because you poured your heart and soul into achieving the things that matter the most to you. You are happy because you exercised your freedom to do and to pursue the things that matter most to you. The BIGGEST lesson I learnt last year can be summed up in one phrase ‘PURSUE YOUR PASSION(S) and GO AFTER YOUR DREAMS’. We all have things in our lives that bring us the greatest joy and add meaning and purpose to our lives. Those things are the desires of your heart and they are signposts to help you to pinpoint your passion(s) and if pursued allows you to build a life of meaning and purpose. You owe it to yourself to identify your passion(s), to follow your passion(s) and to live a life of purpose, meaning and fulfilment by pursuing the things that bring you the greatest joy and enables you to be a blessing to others. In the words of Fabienne Fredrickson “The things you are passionate about are not random, they are your calling.” There is nothing as fulfilling and as life changing as having the boldness to pursue the things that you are passionate about. It is the secret to living a life of happiness, fulfilment and contentment. We go through years of education just to prepare for a career that in some cases ends up not bringing us the fulfilment that we so desperately desire and all the while the very thing that will bring us the greatest fulfilment in life which is actually the desires of our hearts which is expressed as our passion(s) is left largely ignored. So, life transforming was this revelation that I now teach my students not to discount their passions as they pursue academic excellence. If I see a passion that they have an exceptional giftedness in, I encourage it with every fibre of my being because I have come to realise that your passion(s) gives you the freedom to be your creative best and to produce your most excellent and meaningful work. The best part of pursuing your passion is that in time you can turn your passion into a career. God has put a gift or talent in EVERY person and should you choose to pursue it, the world will adjust and make room to accommodate it and even pay you for it. In 2017, decide to exercise your gift and find the gateway to a life of real fulfilment, purpose, and contentment in your work. It is interesting to note that the Bible does not say that a man's education will make room for him, but that it is his gift which does. Find your gift and pursue education that is in line with your gift. The education you pursue in line with your gift will allow you to sharpen that gift. Most people don’t realise that the gift they are sitting on expressed as their passion(s) is loaded. The world won't move over for you just because you're smart. However, when you exercise your gift, not only will the world make room for you, but it will also pay you for it. Do what God has given you the grace to do and genuinely serve others with that gift. There is joy in lightening the load of another by serving them with your gift. No matter how big the world is, there's a place for you in it when you discover and manifest your gift. Your passion is simply the expression of the stirring inside of you that seeks to edify and bless the sphere of influence that God has placed you in with your gifts, talents and abilities. So in 2017, prayerfully find out what stirs you the most and make it a lifestyle. The beginning of the year is a perfect time to actually sit down and to map out the future you desire to have in 2017. What you don't plan and act upon, will never happen. By clearly writing down your goals and specifying exactly what it is that you want to achieve in 2017 and specifying the timeframe within which you want to achieve those goals will go a long way to making 2017 a fruitful year. Journaling allows you to do just that YET it is one of the lesser known SECRETS of GREAT productivity. The word journal comes from the French word "jour" and from the Latin word "diurnalis" meaning daily. Thus, a journal is some form of notebook in which daily writing (or at least regular writing) is recorded. You see the world is ruled by ideas and EVERY single day even on social media we come into contact with SO many ideas but most people take these ideas and even their own ideas which God so generously gives them for granted. We don't curate the ideas we receive or come across & neither do we take the time to reflect on it or action it. The best way to organise all those ideas is to keep a journal. The discipline of keeping a planner or journal will allow you to do this. In 2017, decide to be a collector of ideas through journaling. It allows you to be watchful and to notice the things around you. Journaling is one of the MOST overlooked & underappreciated of spiritual disciplines. Journaling is the difference between learning & remembering. It is the difference between forgetting & fulfilling. Journaling allows you to become a student of your own life, your own future, your own destiny. Journals help you to write down your own ideas and the ideas around you and to clarify your thoughts. It allows you to jot down your feelings, responses, and the insights into daily events that occur in your life. This gives you the opportunity to discover what you actually think and how you feel about different topics and events. You might think that you will remember everything you see and experience around you but it is very easy to forget VALUABLE information and that is why you should keep a journal. You can't always trust your memory to recall every single specific detail about an event. When you listen to something valuable, write it down. When you come across something important, write it down. The discipline of journaling allows you to turn your wishes into dreams and your dreams into goals and your goals into actionable plans. Journaling is truly transformational in every sense of the word. It is not for nothing that God instructs Habakkuk in Habakkuk Chapter 2: verses 2-3 to: “Write the vision and make it plain on tablets, that he may run who reads it. For the vision is yet for an appointed time; but at the end it will speak, and it will not lie. Though it tarries, wait for it; because it will surely come, it will not tarry". When you look back at your journal in years to come you will marvel & stand in awe at the faithfulness of God. What you pray, plan for and act on in union with God, God is committed to helping you bring it to pass. I don’t know what this coming year holds but I do know the God who holds 2017 and His promise to us all as expressed in scripture is that ‘…I will never leave you nor forsake you. So we may boldly say: The Lord is my helper; I will not fear…’-Hebrews 13:5-6. So, in 2017 go boldly in the direction of the things that set your soul on fire and trust in the contentment of God’s provision, the companionship of His presence, the confidence of His promises and the comfort of His protection. I wish you all a very happy new year & thank you all so much for your continued support. I have incredibly amazing content planned for this year that will add real value and impart tangible blessings to your life. Psalm 65:11-'You crown the year with Your Goodness and Your paths drip with abundance'. It’s an autumn day in London…the weather is beautiful. It’s not so warm today and it’s not too cold. It’s pretty picture perfect and I am on the set of my first photoshoot for my blog. The location is the University of Greenwich campus as the pursuit of learning and bettering oneself is an endeavour that is very close to my heart. You see I am an educator. That is my COMFORT ZONE. That is what I do and have been doing for over a decade. Being in front of my students in the classroom is where I come alive. So why Angie…why are you putting yourself through this new chapter…why are you blogging and why now??? You see, I am a girlie girl at heart and like your typical girl I love all things fashion, beauty, makeup, hair, travel etc. etc. but I am also VERY passionate about EDUCATION especially girl’s education. For me education is so much more than just learning facts and figures and regurgitating them in an exam. It’s about being exposed to new forms of knowledge, being changed for the better through that knowledge and using the privilege of having that knowledge to make an impact in your world by making a positive contribution to your sphere of influence for the better. Being in the classroom and seeing first-hand the sometimes not so positive effects that social media has on young girls and sometimes even grown women where they are left playing the comparison game and feeling the pressure to conform just to be part of the ‘in-crowd’ or feeling that they are not enough or that they need to have the ‘latest’ on trend things to be seen as "cool", I wanted to add my voice in changing this narrative. I wanted girls especially young women to realise that yes it’s ok to look good because of a truth as the saying goes ‘…you are addressed the way you dress’ but let fashion be an addition to you and not the focal point of your existence. Tastes in clothes will change and do change and what you like at 15 years of age is not necessarily what you will like at 25 years of age or beyond. So make investments in bettering yourself that will outlast changing fads and trends. Of course, you should look good and put your best face forward(I do that too) BUT beyond that why not place a GREATER weight on working on yourself to develop values, virtues and graces that will never go out of style no matter what season it is. Why not let the beauty, amazement, creativity and wonder that the fashion and beauty industry allows us to behold to inspire us to paint those same beautiful images and descriptions on the canvas of our hearts. What benefit is it to look so good on the outside but not have that reflect on the inside to the core of who you are? As a woman, I think the biggest compliment that anyone can pay you when they encounter your awesomeness is to say that your inner virtues and qualities far surpass who you are outwardly. Developing inward attributes worthy of emulation is not automatic. It's something you must be convinced of as necessary to your being and advancement in life and commit to working on. Outward beauty is transient BUT inner beauty will outlast and outshine any physical attribute as well as stand the test of time. How about adding value to yourself by taking your EDUCATION so seriously and excelling in it such that it gives you options in life and opens up so many wonderful doors of opportunity for you to also make a difference in the lives of others. Even if your days of going to school or your academic years are way behind you, you can still commit yourself to lifelong learning by making a commitment to bettering yourself by investing in your dreams and goals by learning something new that will move your personal life, family life, career or pursuits into new dimensions and new realms that will add value to your life and to those in your sphere of influence. I am sharing all this to say that you if you too like me has a burning passion to see the world change for the better in some way, then whatever contribution you can make to get that vision off the ground...START NOW!!! This week why not send that email, make that phone call, reach out to that person you've been wanting to make contact with, start that business, start that ministry, buy that domain name. Whatever it takes, just start. You may not have all the resources. You may not have all the necessary knowledge to START but START anyway. It’s Ok to learn as you go along. It’s all part of the journey. It might take you out of your comfort zone as you can see in my pictures on this post. When the shoot started off I was quite nervous as it was way out of my comfort zone but I had to remind myself of the cause and why I was doing it and as the shoot progressed I totally relaxed and enjoyed it. Something magical happens when you START. Resources that you didn’t even know about will gravitate towards you. People that you didn’t even expect or didn’t even know existed will come into your life and will rally around you to help you bring the vision to pass. Finances and various other resources will make its way towards you. You see provision will always flow in the direction of vision. When I added the interview segment to my YouTube channel (Angie Broks), one of the fascinating and surprising things I realised in interviewing personalities who were influencers in their field is that they are all just ordinary people who just took a chance to make a START on their burning desires and the ensuing results were mind blowing!!! Even in the mistakes they learnt valuable lessons which moved their careers further along. So don't be afraid to START because you think you might fail. Even in the failures, you learn valuable lessons that will give you a competitive edge. There comes a time where you’ve thought about it long enough, where you’ve prayed about it long enough and NOW it’s time to step out in faith and START. So, START now, START where you are and START with what you have. A year from now you would have wished you had started. Doubt kills more dreams than failure ever did. Don’t let the fear of failure stop you from trying. There is a reason why you can’t stop thinking about it. So, START it. It’s in the process that you experience the miracles. That’s why you must begin. There are handfuls of purpose that are laid out on the journey in front of you but you must boldly step out and begin for you to come into that level of provision. I have met some amazing people who I otherwise would not have met had I not STARTED this journey. They have been a tremendous blessing in terms of helping me to get the vision off the ground. There are divine helpers waiting on you to START so they can contribute to your work and help you bring the vision to pass. Now it’s your turn…kindly comment below by sharing with me just ONE thing you’ve done this year that took you out of your comfort zone and what lessons you’ve learnt in taking that step of faith. As ever thanks for reading this blog entry and for your continued support. *Special thanks to Fortunate of Staying Lush for the ‘face beat’ a.k.a makeup. Do definitely check out her work on Instagram @stayinglush. This chica is a prowess when it comes to makeup. So in the last few weeks on my YouTube channel, you might have seen an exclusive interview that was granted to me by Adejoke Rukky Ladoja the Creative Designer of the women’s ready-to-wear brand GREY based in Nigeria in West Africa. She is one of the pioneers of the ready-to-wear clothing experience which is currently transforming the African fashion scene. Her career in fashion which she so generously shared with me during the interview was SUPER inspiring!!! I came away from that interview totally blown away by her sheer expertise and technical-know-how not just about fashion but most importantly about the business of fashion. Location: St. Paul's Cathedral's church yard. It is so picturesque!!! I chose St. Paul's Cathedral for this photo shoot because there is a quiet, calm and serene ambience that the huge cathedral building casts over the beautiful grounds that surrounds it. Every once in a while, if I happen to be in this area, I enjoy popping into the cathedral just to have a quiet, peaceful and reflective moment with my thoughts and with God. Matthew 11:28-29-''Come to Me, all you who labor and are heavy laden, and I will give you rest. Take My yoke upon you and learn from Me, for I am gentle and lowly in heart, and you will find rest for your souls''. St Paul's Cathedral, London sits on Ludgate Hill at the highest point of the City of London. The present church, dating from the late 17th century, was designed in the Baroque style by Sir Christopher Wren. It's construction, completed in Wren's lifetime, was part of a major rebuilding programme in the City of London after the Great Fire of London in 1666. The original church which was on this same site was founded in AD 604. The cathedral is one of the most famous and most recognisable sights of London. Its dome, framed by the spires of Wren's City churches, dominated the skyline for 300 years. At 365 feet (111 m) high, it was the tallest building in London from 1710 to 1967. The dome is among the highest in the world. St Paul's Cathedral is the second largest church building based on it's dimensions in area in the United Kingdom after Liverpool(source:Wikipedia). So here’s the back story that inspired this photo shoot. In deciding what to wear to interview the Creative Designer of GREY(Nigeria) for my YouTube channel ‘Angie Broks’, I thought it would be nice idea to pay homage to the fashion label by wearing one of their pieces from their spring/summer 2016 collection for the interview. This turned out to be such a great idea as the Creative Designer of Grey Nigeria Joke Ladoja(Rukky) during the interview absolutely loved how I had styled her piece and even commented how my styling was going to serve as an inspiration for styling a future collection by the label(That put a REALLY huge smile on my face). I first came across the fashion label GREY from reading a fashion post on the popular blog BellaNaija. It was an editorial spread that had been written for the label during one of the Lagos Fashion & Design weeks (LFDW).I remember looking at their clothes on the catwalk models at LFDW and being particularly drawn to the clean, fuss-free aesthetics on their clothing. The clothes seemed so functional too!! These were pieces that could translate very easily from the catwalk to your wardrobe. Sometimes some catwalk pieces can be so avant-garde that you cannot see yourself in them but these clothes I saw from GREY on the catwalk were pieces I could see myself not just wearing but also styling in so many different ways. It also helped that their pieces were fuss-free and ready to wear. Ready to wear is a concept that is gradually growing and becoming steadily popular on the African fashion scene because it's purchase is as fuss free as just picking an item of clothing off the rack and readily wearing it. It eliminates the hit and misses of sometimes having a tailor/seamstress make your clothes which has been traditionally been the trend in African fashion. GREY (Nigeria) is one of the pioneers in ready to wear clothing not just in Nigeria but on the African continent. The outfit I am wearing in this photo shoot is from GREY's SS16 collection. This collection uses etches of doll-like illustrations, laser cut techniques, exaggerated larger-than-life bows within a mix-match of colours and prints. GREY in this SS16 collection goes on it's most explorative and adventrous foray into 'the often uneven, imperfect yet inspirational stories of women both from a personal and a socio-political platform'', says Rukky Ladoja(GREY's Creative Director) speaking about the inspiration behind this collection. It was really difficult for me to choose just that one item from their SS16 (Spring/Summer 2016) collection that I could see myself styling in more ways than one. This is because all the pieces from this collection was so nicely put together. Thankfully I was browsing through Instagram one day and I saw one of my style icons Zainab Balogun in one of GREY’s pieces. She looked so classy and elegant in this particular item and that sold the outfit to me. I didn’t even need to think twice. Picture of: Zainab Balogun in a GREY SS16 piece. The next thing I had to do was to find out how to contact the label to see if they shipped to the UK so off to their Instagram page I went to find their contact details. It was from that point onwards that my love affair with this fashion label developed. But like with my approach to most things in life, I pray and then take a leap of faith. This was a leap of faith that I hoped would pay off and bwoy it so did!!! So I paid for the dress online via a direct bank transfer and they gave me a two week time line to have the dress ready. They kept their word. Exactly 2 weeks after I paid for my dress, I got a WhatsApp message telling me that my outfit was ready and that it was being prepared to be shipped to London to me. About 5 days later voila!! !...my dress arrived!!! I was at home one morning when the post man arrived with a package for me. I saw on the label that it was from Nigeria so I knew it had to be from GREY. Excitement got the better of me and I hurriedly ripped the package open to reveal one of the most exquisite presentations of a packaged clothing piece. The love, care and attention to detail in just packing that one dress blew me away. I didn’t even want to unwrap the packaging to reveal THE DRESS. That’s when I finally understood the hype about GREY. Chale they are not playing kraaaa oh!!! A part of me was thinking that maybe the packaging is nice but what about the actual clothes. So I gently unwrapped the packaging to do a dress reveal. The dress sat so exquisitely in the packaging. It was a really rich and super gorgeous jacquard print weave with an assortment of different pieces put together. Now can I just take a moment to gasp about the fabric…my gosh!!! It was a very rich soft velvelty jacquard weave and it felt so comfortable just touching it. I could find absolutely nothing wrong with it. The expert craftsmanship and attention to detail spoke for itself. Now it was time to try the dress on. Mind you, at the time of placing the order, the only thing I was asked was my standard UK size. Those were the only details they required. So you can imagine my shock and utter delight when I tried on the dress and it was a perfect fit. In fact, it fit like a glove!!! There was no need for any adjustment or alteration. I was shocked!!! I am a pint petite size with quite a generous amount of natural ‘African endowments’ if you know what I mean…laughing out loud. It’s not always easy to get clothes that fit like a glove so for GREY to have catered to my body shape so exquisitely is a testament to their expert tailoring and craftsmanship. What I especially love about this particular dress is the fact that from just this one dress, I am able to create 5 unique and differing styles all from that one dress and I can style it to make it appropriate for work, church, a wedding, a night out or an evening function. It’s so versatile and as such it’s also GREAT value for money. Their price point is also really generous based on what you are actually getting for your money’s worth. The colour pattern of the mix-match fabric print on this dress with its foray of colours makes it suitable in all weathers. The rich dark blue hues makes it winter appropriate and the yellow colour wave makes it spring and summer appropriate too. I love clothes that can be worn in all weather conditions and climates. Ain’t nobody got time for one-day-wonder clothes (i.e. clothes that you only wear once and afterwards you hoard in your wardrobe just taking up space and waiting on another grand function to make a re-appearance). You want an outfit that delivers in all weathers conditions and can be worn for diverse occasions. So thank you GREY for making beautiful clothes. Thanks for being a pace setter in the ready to wear clothing market in Africa. Of a truth, with this dress, you do stay true to your fashion slogan because the design of this dress REALLY does meet functionality. As ever, special thanks to you too for taking the time to read this blog post. Life is so delicate and so precious. I value greatly God’s gift of life and birthdays are memorable events worth marking and reflecting on. Even though I have lived in the United Kingdom for the past 19 years, I was born and raised in Accra the capital city of Ghana in West Africa. It is always a blessing to spend my birthday in Accra with my family and friends. Thankfully my birthday almost always falls around the Easter vacation. I get a little over 2 weeks off for the Easter vacation. As soon as school’s out for the Easter vacation, my student’s know that there is but only ONE destination on my mind…Accra!!! Accra is the capital city of Ghana with a population size approaching almost 27 million people. English is the official language of Ghana, but not necessarily the first language for many people. The local language in Accra is Ga, but Twi (pronounced 'chwee'), Ewe (pronounced ayvay), Hausa, and English are also widely spoken. Founded in the 17th century by the Ga people, Accra became the capital of the British Gold Coast in 1877. Following Ghana's independence in 1957, Accra became the capital of the newly independent state. For my birthday shoot, I deliberately chose ‘The Black Star Square’, also known as ‘The Independence Square’, which is a public square in Accra, Ghana as my location of choice because of the connotations of ‘Independence’, ‘Freedom’ and ‘Liberty’ that it encapsulates. In the last 12 months these themes have become very precious to me. I wanted to explore these themes and their significance going forward in this my new birthday year. I wish I could capture in words just how liberating it was for me to walk onto that vast expanse of wide open space you see in front of me at the Independence Arch in Accra and feeling the cool breeze from the Atlantic Ocean(which is just beyond the Independence Arc) blowing across my face. From a very young age, I have always had a sense of duty and wanting to serve God by serving mankind. The noble role of educating, nurturing and impacting the next generation of future leaders is one that I take very seriously as it fulfils a portion of my sense of duty. Knowing the selfless sacrifices that have been made to get me to where I currently find myself at this moment in my life and the depth of investment that has been made into my life, I have never been comfortable just to live life to gratify self. I was brought up to consider serving others as a great privilege and a real honour. Beyond the classroom though, there are so many other things that I am passionate about but somehow up until now, I never really shared that side of my life with people other than my family and friends. Sometime last year I had an epiphany experience where I realised that I could actually also serve others through the use of my God given gifts and talents. That revelation gave birth to the ‘Angie Broks’ project. There is something so liberating and empowering about embracing all of who you are and living God’s truth in your life. In the last few months I have come to realise that AUTHENTICITY and being true to one’s self is so important. Bringing all of who you are to any endeavour gives you a very unique advantage. There is a PRECIOUS sense of FREEDOM that comes when you finally embrace God’s call on your life and live and walk in that truth. I remember when I released the ‘Full Length’ video to introduce the ‘Angie Broks' project, one of my friends posted this message on my YouTube channel…She simply said ‘Glad to see you coming full circle into your own’. And that sentence REALLY encapsulates what this birthday shoot and the launch of ‘Angie Broks’ means to me. It ushered in a new season of my life where God is bringing me full circle into my own and what He has called me to do to serve mankind. There is an expanse of GREAT pleasure and FULFILMENT that God has uniquely carved out for each and every one of us. God is just waiting on us to say YES to His plan for our lives. So if you aren’t sure of your life’s purpose, just do what you do well and just watch God confirm it by blessing your endeavours with success. You will be so amazed when you stand back and watch how what you do makes a difference in the life of others. Don’t waste your time trying to do what you’re not gifted at just because you see someone else doing it. Equally don’t let others dictate how you should be doing life or what your service to God and to mankind ought to look like. That’s something that needs to be worked out between you and God alone. Once you've worked that out, go out and live that unique path and be a BLESSING to others in the process. You will know when you are operating in our gifts and calling because what you do will minister life to others and will fill you with so much joy and fulfilment. If what you do is making you miserable and is filling you with a sense of dread, that's a clue right there that you're not in God’s perfect will. God gives us peace and joy to let us know we’re fulfilling His perfect plan. Look at what you enjoy, what you’re good at, and what God is giving you the GRACE to do. It is my prayer that this post inspires you to have the courage to FOLLOW your HEART and your DREAMS. The last 12 months since I embraced the call to start ‘Angie Broks’ has been pretty much beyond amazing in every sense of the word. It's a step of faith and I am learning to walk out my purpose daily. From my earliest recollection of my younger years, I think I have always had a very strong sense of what I wanted to wear. I owe it in part to my Mum who encouraged individuality in all her children and lovingly nurtured us in a home environment where our personal views were encouraged and this translated into what I wore. 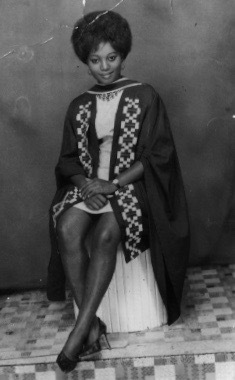 My Mum's photo was taken in October 1970 after being awarded a BSC in Home Economics from the University of Ghana, Legon. I also owe my sense of style in part to my paternal Grandmother. I was named after my Dad’s Mum, my grandmother, Maame Anima of Old Tafo in the Eastern Region of my native country of birth, Ghana. What I recall about my grandmother growing up is that she was always meticulously dressed and she paid attention to every detail of her appearance. From the top of her head to the soles of her feet, she was always pristinely and immaculately dressed. On family trips to Old Tafo, my relatives upon seeing me would always remark in my native Akyem dialect of Twi that ‘you are truly Maame Anima’s granddaughter’’. She was a woman who expressed her creativity and uniqueness through her clothes and her unique sense of style. She was a very prayerful woman with a burden for deep intercessory prayer for her family and wider community. Everyone who came into contact with her spoke of her warmth, compassion and kindness. Everyone’s burden was her burden. She was an embodiment of the Biblical quote in Proverbs 31:30 which says that ‘Charm is deceptive and beauty is fleeting BUT a woman who fears the Lord shall be praised’’. Her outer beauty expressed through her personal style was a result of an inner fortitude borne out of a personal relationship with her Creator. These are values I have come to embrace in my own life as I have realised experientially the transient nature of focusing on outward beauty at the expense of inner beauty. In preparing to launch this website, I did some research into my Grandmother’s fashion sense and surprise…surprise…the parallels between us was rather quite astonishing!!! All her clothes matched and guess what mine most in general do too…lol. She loved scarves and so do I. When it came to jewellery she loved pure metals or would wear unique and indigenous beads. I love accessories. I think they make the simplest of outfits come alive. She wore pumps for comfort and she loved sandals…hmmmm…well…like Grandma like granddaughter, when it comes to footwear, comfort for me is key. I am constantly on my feet in the classroom as an Educator so I love wearing loafers, brogues and ballerina pumps for school. In the warmer spring/summer months. I love cute footwear and sandals. Maame Anima’s hair was natural. She threaded it meticulously and loved to sport head scarves too. Well…ahem…this granddaughter of Maame Anima rocks natural hair too and I have done so for the last 14 years. P.S-Under the ‘Afro Hair Care’ section of this website, I share my natural afro hair journey as well as a plethora of effective tips and tricks for maintaining healthy natural afro hair. My Grandmother's photo was taken in 1975 in my home town of Old Tafo in the Eastern Region. She was the President of The Women's Fellowship at her church and the picture was taken after a visit in her home by the church members. So…what is my personal style? I think it is an eclectic mix of the sense of individuality that my Mum instilled in me as well as my Grandmother’s fashion sense. In my clothes you will always find a piece of my African/Ghanaian heritage in there plus style influences from living and working in a city as cosmopolitan as London. I love to travel and my fashion sense draws inspiration from the people and places I have had the privilege of visiting and blending it all in to create something I can uniquely call my own. That’s the beauty of style. It’s about fusing all these influences together and making it your own. It’s about giving your clothes a voice by expressing who you are creatively through them and embracing your God-given identity through them. I hope that from the posts in this section of my webpage you too will draw inspiration from my style ideas and tips and embrace your own sense of identity, individuality and uniqueness through what you wear. When it comes to clothes it’s about being you, being authentic and embracing your unique God-given identity and expressing it through what you wear. When you are comfortable in your own skin and in what you are wearing, you radiate and exude an air of confidence and attractiveness which permeates every environment you walk into. So…be bold…be daring and don’t be afraid to try new things.